I grew up around the fire pit and every time I see one it brings a feeling of fond nostalgia. I’m sure many others can relate and it’s a tradition I’ve carried on with my children too. 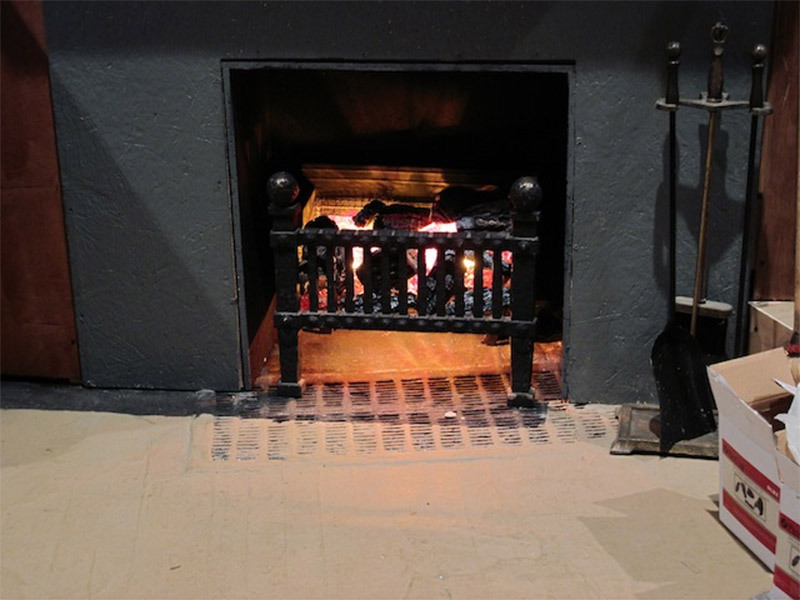 You can capture this very same feeling indoors with a fake flameless firepit or campfire. There are a variety of ways to accomplish this and they are all super easy to do. You just need a few stones, some short sticks and a strand of LED mini-lights. Arrange the stones in a circle then arrange the sticks in a cone shape over the stones. Intertwine the lights around the sticks to resemble a cozy flame. Easy! 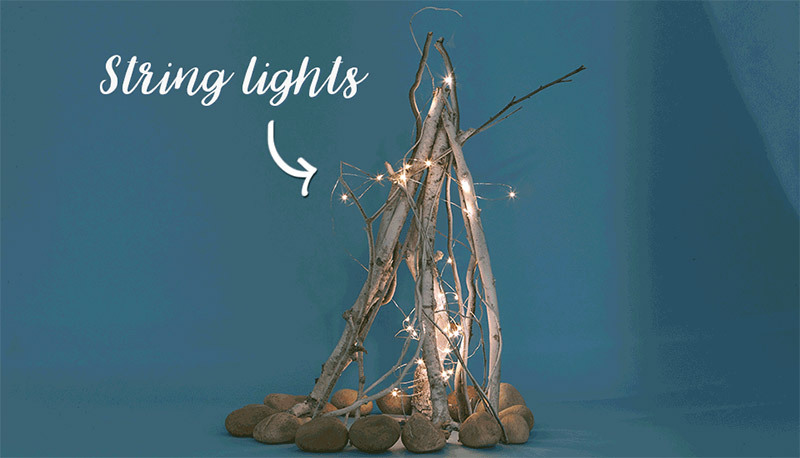 For a minimalist look take a few light-colored stones, some short sticks painted white(or if you can find white wood like birch that would be even better) and a strand of LED mini-light. Arrange the stones in a circle then place the lights in a pile in the center of the stones. Arrange the sticks in a cone shape over the stones. Done. 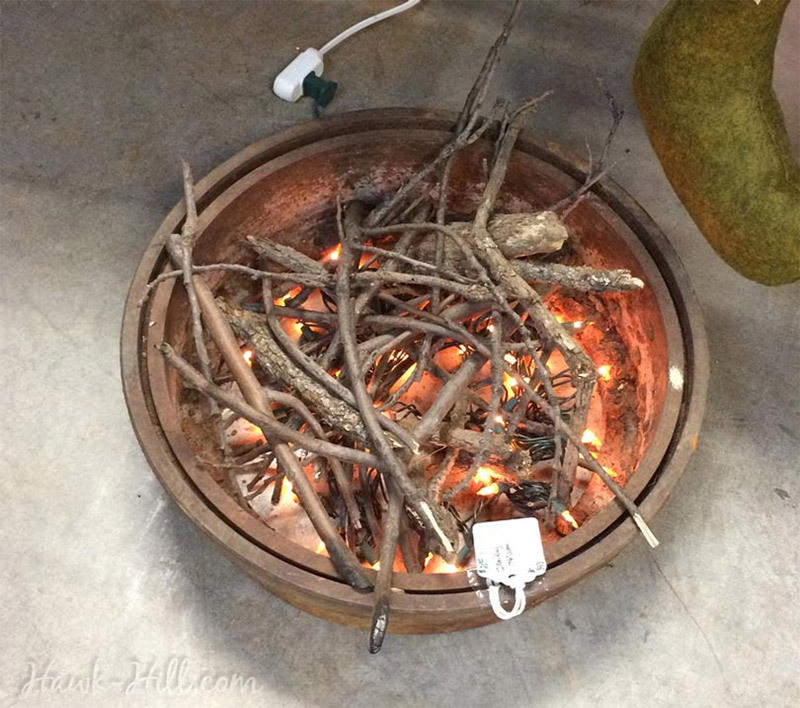 For a pretty take on fake firepits you can create lace sticks. You will need sticks at least ¾ inch in diameter. Take your sticks and cover them with aluminum foil. 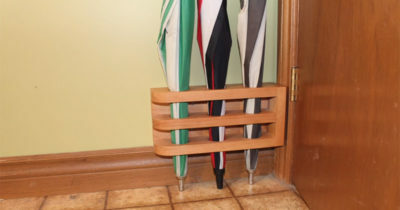 Cover every bit of wood. Next take your lace strips and dip them in fabric stiffener or glue. Carefully wrap each branch in the soaked lace working your way from one end to the other. Make sure the pieces overlap well. Let your branches dry overnight. The next morning cut one slit in the lace “cast” from one end to the other and remove the branch from the center. Next remove the aluminum foil from the lace and discard it. Now you have beautiful lace sticks for your firepit! Form your stones in a circle and place a pile of stringed lights in the center of them. Arrange your beautiful sticks over the stones in a cone shape. A beautiful setting for the holidays. 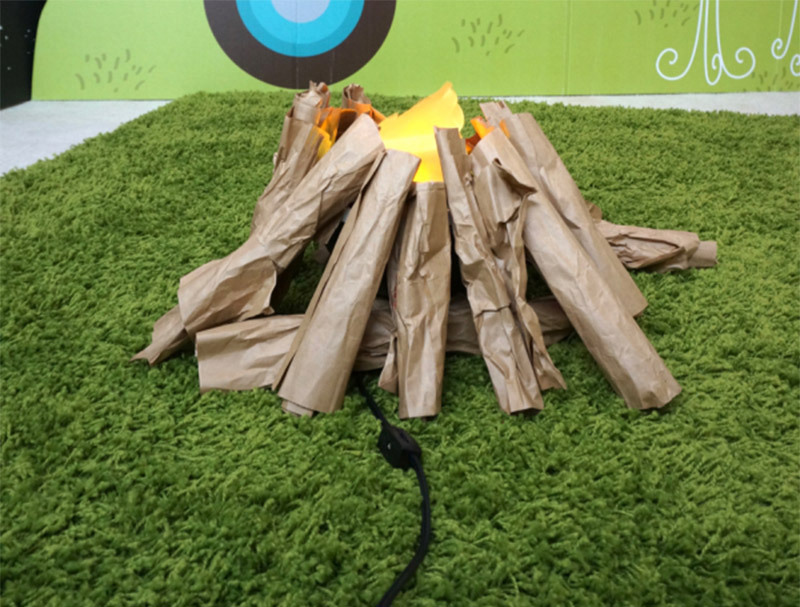 The key to creating a simple realistic-looking flameless fake firepit is in the sticks. Choose sticks that have one end blackened by fire already, or you can burn them yourself as well. If you don’t want to mess with real fire here just paint one end of the sticks black and gradually fade the paint as you go up the sticks for that burnt look. Arrange stones in a circle, place lights in the center and then place your sticks in a teepee shape over the stones. Be sure to put the blackened ends at the top so it looks like they’re burning! 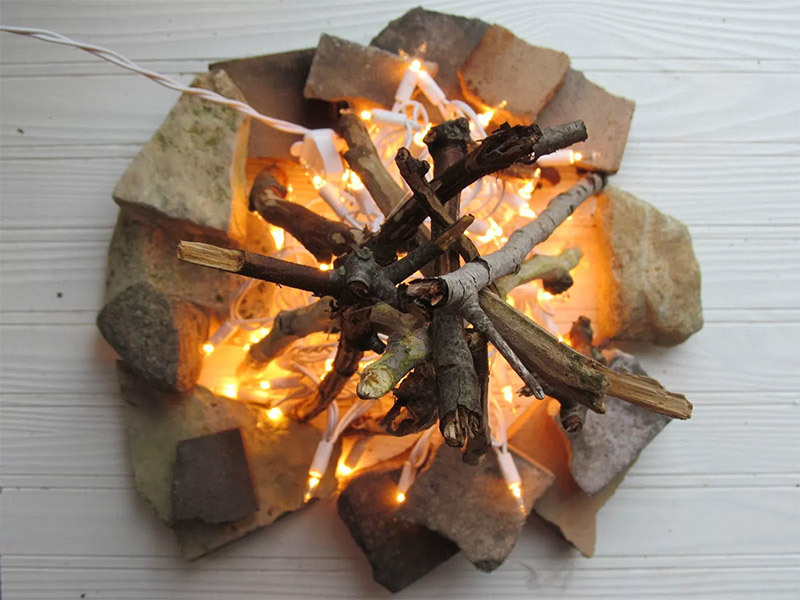 Here’s a guide for a peaceful & calm fire pit. Take a container that you would like to use as the firepit and paint the inside black using a flat paint or chalk paint. This will give an authentic burnt feel. Then get four flameless LED tea lights. Stick double-sided foam tape to the bottoms and stick the tea lights to the sides inside the container. Fill the container with pretty clear gems. Or pretty much whatever you want! You can also just wiggle the tea lights into the gems until they stay in position if you want to skip the tape. Here’s a great project to get the kids involved with. This flameless fire pit begins with a Hanging Fiery Pot. This particular pot has a silk flame that moves when you turn it on for a great “real” feel. Take a few brown paper shopping bags and cut them into long strips. Let the kids twist and crinkle them into log shapes. Put double-sided sticky tape around the outer edge of the pot for the logs to stick to. This keeps them from falling over. Simply lean them against the pot in a teepee shape and you’re good to go. 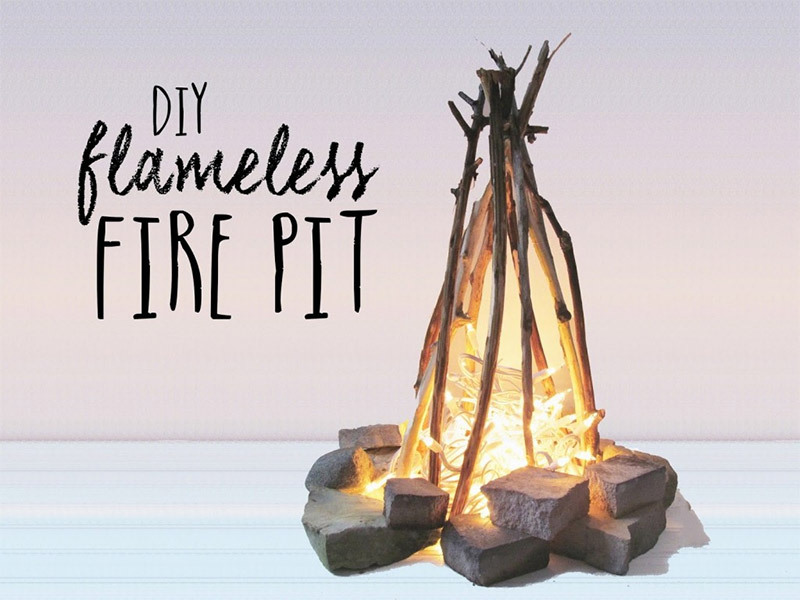 You can make your own fake embers to put into a firepit with a few cheap supplies. Get some clear plastic beads and some sheets of orange lighting gel. Shred the sheets of lighting gel. Make some molds for your embers out of aluminum foil by creating a variety of shapes. Wrap the foil around cups, cans, boxes or whatever you have around. You should end up with a variety of open-ended, cup shapes. 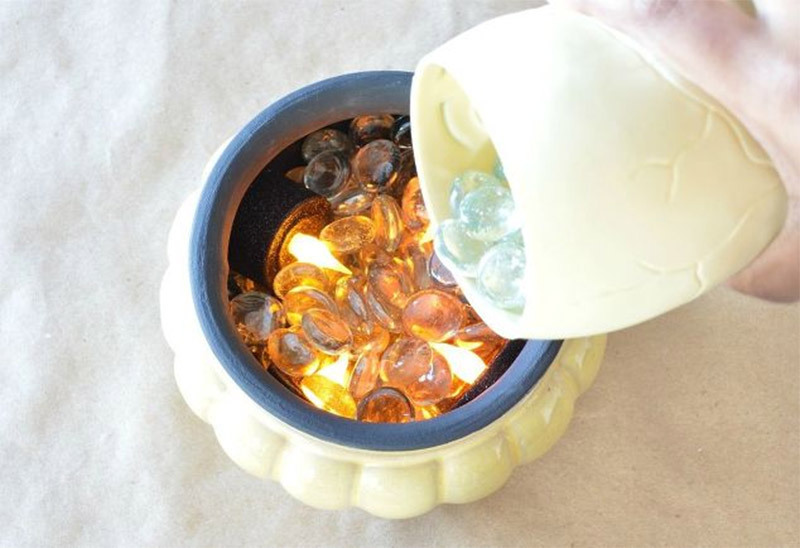 Fill the molds with beads and the lighting gel shreds. Bake at 400 degrees for 20 minutes or until the mixture is melted. After these cool remove the foil. They look just like burning logs when you place them in front of flickering LED lighting. Locate an authentic looking vessel for your fire. A metal washtub or rustic container like a shallow metal bucket works well. Then place flickering orange string lights in the bottom of the container. Carefully and strategically arrange some sticks on the top of the container so that light shines through, but so you can’t see the actual string of lights. 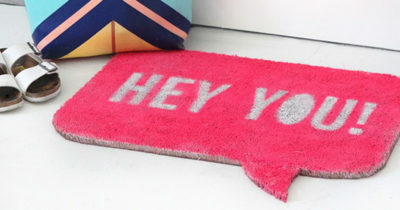 Brilliant and super easy for that faux-fire look. 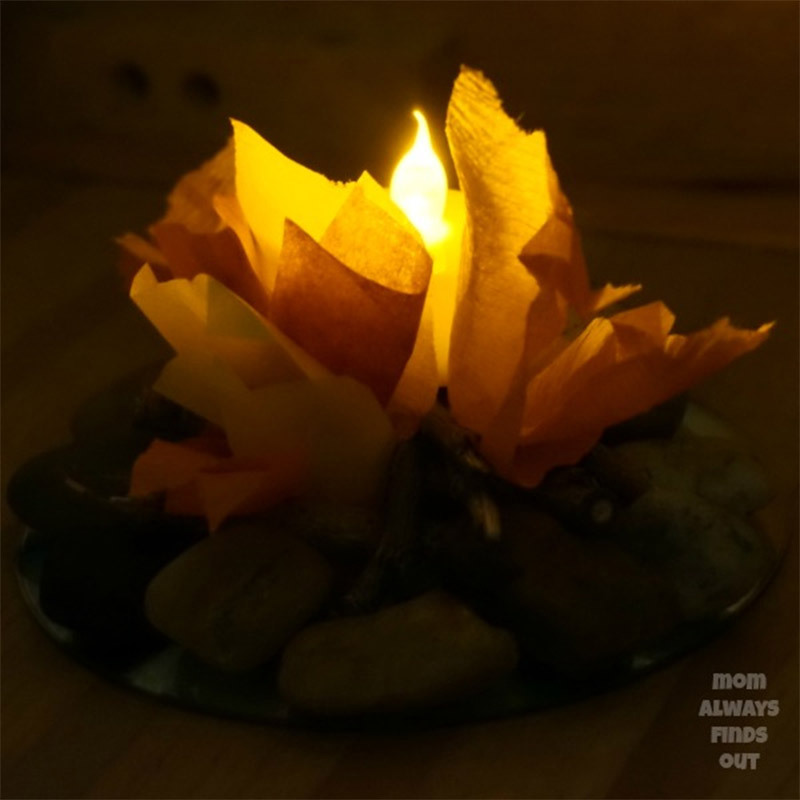 Kids will love this simple campfire and they can help make it too. Cut flame shapes out of red and orange construction paper. 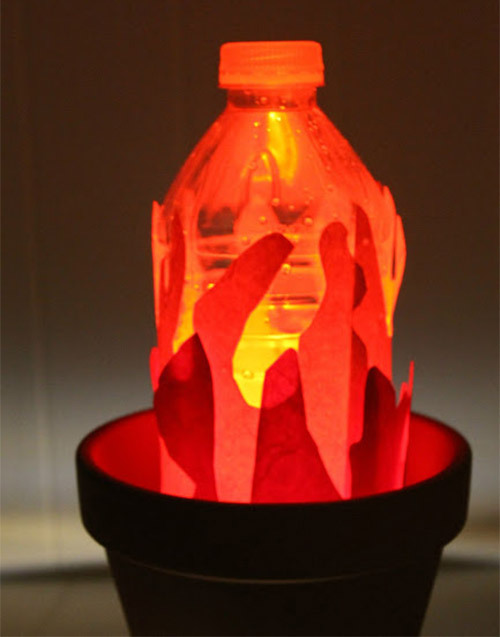 Glue the flames to the outside of an empty plastic water bottle. Add 1-2” of water and a few drops of red food coloring in the bottle. Put the lid on and shake to mix it up. Place your phone with the flashlight app turned on (or another light source) in the bottom of a clay pot. Then place the bottle on top of it. Anytime the water moves you’ll get a fun flame dance. 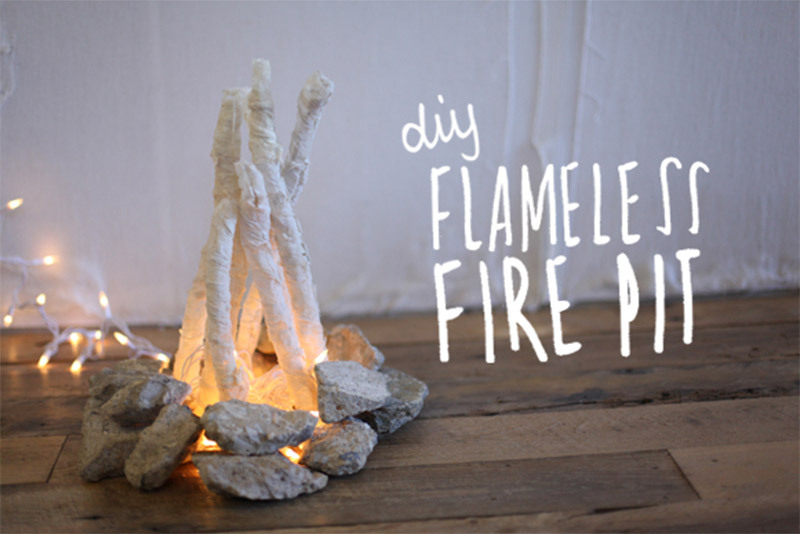 To add a touch of campfire to any space you can make these perfect mini-fires. Place a flameless tea light in the middle of a CD disc. Next glue small stones around the tea light. Now arrange short sticks around the stones and glue them in place. Leave a bit of room to remove the tea light so you can turn it on and off. Carefully glue pieces of red, orange and yellow torn tissue paper in and around the sticks to form the flames. Kudos if you can get it totally surrounded with any sign of the lights! 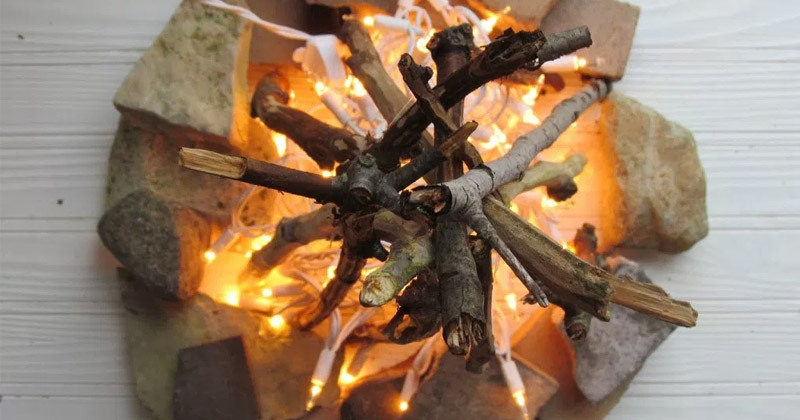 Creating that campfire atmosphere with the fire is easy to do, and these fun projects should get you started on the right foot. Hmmm… I feel like S’mores. S’mores anyone?